Harry was born at St Mary's Hospital in Paddington, London, England, on 15 September 1984, the second child of Prince Charles, Prince of Wales, and Diana, Princess of Wales, younger brother of Prince William, and fourth grandchild of Queen Elizabeth II and Prince Philip, Duke of Edinburgh. Baptised at St George's Chapel, in Windsor Castle, by then Archbishop of Canterbury, Robert Runcie, Harry's godparents were his uncle, Prince Andrew, Duke of York; his first cousin once removed, Lady Sarah Armstrong-Jones; Lady Vestey; Mrs William Bartholomew; Bryan Organ; and Gerald Ward. Diana wanted William and Harry to have a broader range of experiences than previous royal children and took both to venues that ranged from Disney World and McDonald's to AIDS clinics and shelters for the homeless. Diana, Princess of Wales, who was by then divorced from the Prince of Wales, died in a car accident in 1997. Harry and his brother and father were staying at Balmoral Castle at the time, and the Prince of Wales waited until early the following morning to tell his sons about their mother's death. At his mother's funeral, Harry accompanied his father, brother, paternal grandfather, and maternal uncle in walking behind the funeral cortège from Kensington Palace to Westminster Abbey. Prince Henry, commonly known as Prince Harry, was born on 15 September 1984, and is the second son of Prince Charles and Princess Diana. 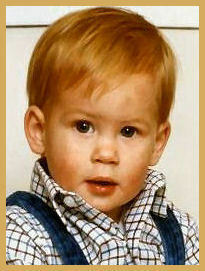 He was christened by the Archbishop of Canterbury at Windsor Castle on 21 December 1984. His parents divorced in 1996 and his mother Princess Diana was killed in a car accident when he was 12 years old in 1997. He and his elder brother William had to endure intense media interest following the death and funeral of Diana. 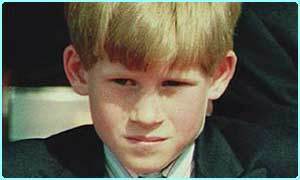 Prince Harry was born on 15 September 1984 at St Mary's Hospital, Paddington, in central London, England. His father is Prince Charles, Prince of Wales, the eldest son of Queen Elizabeth II and Prince Philip, Duke of Edinburgh. His mother is the late Diana, Princess of Wales, who died in 1997, the former wife of the Prince of Wales. He has an elder brother, Prince William. His full title is His Royal Highness Prince Henry of Wales, although he is seldom referred to as anything but Prince Harry. He was christened on 21 December 1984 at St. George's Chapel Windsor Castle by the Archbishop of Canterbury, Dr. Robert Runcie. His godparents were: his uncle the Duke of York, Lady Sarah Chatto, Lady Vestey, Mrs. William Bartholomew; the portrait painter, Mr. Bryan Organ; and Mr. Gerald Ward. The prince's official family name is that of Windsor, according to his grandmother's royal proclamation of 1960, but some of the descendants of Queen Elizabeth II appear to utilize the surname Mountbatten-Windsor as personal preference.